For all the years of my youth and more than 30 years of my adult life, I thought parsley was something grown to decorate a food plate. I’m embarrassed to say that I was over 50 before I found out all the benefits of eating parsley. And even more embarrassed to admit – I was over 60 before I finally found out how to add it to our daily diet in ways that’s are tasty. Parsley is a rich source of anti-oxidant nutrients, Vitamin C, and Vitamin A. And it’s a good source of folic acid, which is one of the most important B vitamins. This can translate into reducing your risk of heart disease, stroke, colon cancer, diabetes, asthma, atherosclerosis, ear infections, and colds. And since Vitamin C is also a powerful anti-inflammatory agent parsley can be useful for any arthritic conditions. Fresh from the garden is the only way to go. Store-bought parsley does not have the taste and flavor of fresh picked. Not only that — but by the time you get the store-bought parsley to your table it probably has little if any nutritional value. I’ve had and used flat leaf parsley in my garden, but I prefer curly leaf parsley. I think it tastes much better. The flat leaf is stronger and little bitter to my taste buds. If you haven’t already started a package of parsley seed — do so now. It can take 2 to 6 weeks to germinate so the sooner you start the better. Several years back I’d soak the seed in warm water for up to 24 hours prior to planting to hasten germination. Now I take the easy road and winter sow at the end of December — and forget it until it’s time to transplant. Germinates beautifully and takes care of itself. If you plan to add this healthful herb to your daily diet, you’ll be able to use every plant that grows from that packet. Sometimes, something will eat parsley off at the base — so I plant in various places to make sure as many plants make it as possible. I tuck it everywhere — all over my garden and in my borders. About half usually make it — with maybe 2 to 5 giving me the lush growth I desire. Parsley is fabulous for the winter garden. With a little protection several plants will provide you with enough to get through the winter — maybe not with the abundance as in summer — but with rationing – it should get you through. Parsley is biennial – lasting two years. It has lush growth the first year — and starts out lush the second. Then it goes to seed and you won’t get enough to use. So be sure and start seed again the second year. It can reseed itself — but if you disturb the area like I do — you probably won’t get those volunteers. Although you can certainly cook with parsley for added flavor, to get the most nutrients serve it fresh whenever you can. 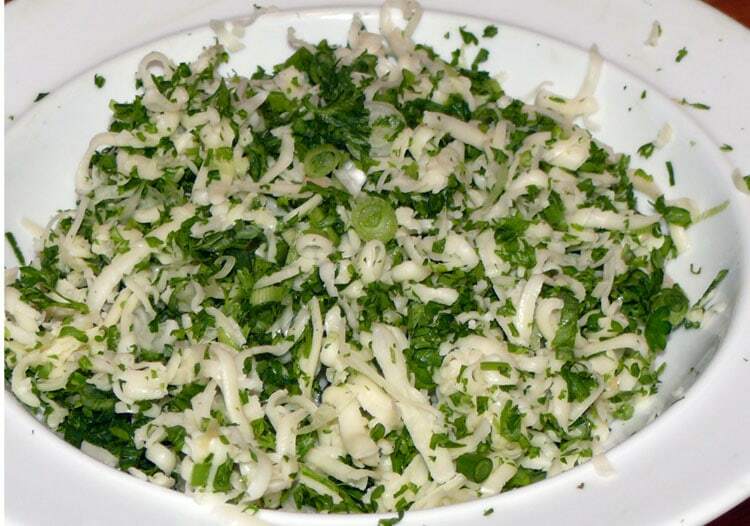 Finely chopped parsley and spring onions tossed with shredded cheese. It’s delicious on almost any kind of sandwich or as the main filling if you desire. If you’re a meat eater — try it on a burger or roast beef sandwich. It’s great with avocado, baby lettuce and spinach (also tossed with olive oil and vinegar) in a pita pocket. Leave off the oil and vinegar and use it to top off your homemade pizza. Finely chopped fresh parsley can be used to top any kind of pasta dish or anything else for that matter. And it’s great in salads. Add it to pesto sauce. Growing your own parsley is an easy way to provide a good part of the nutrients your body needs without relying on outside sources. It’s another step towards being more independent. Remember — the purpose of food is to nourish your body and keep you and your family healthy. It takes a variety of good food. Adding parsley to your daily diet can be a tremendous boost to getting the proper nutrients your body needs and be a delicious addition to your meals. Yum, This post makes me hungry. We love parsley in tabouli also. I let my older parsley go to seed every year, then in the spring, I find lots of volunteers to make my new plants. They don’t seem to mind being transplanted to other locations when they are very small. Butterflies love it too so I always plant extra for the caterpillars. By the way, this line, “the purpose of food is to nourish your body and keep you and your family healthy. It takes a variety of good food.” really caught my attention. I think this is one of the most important things we have lost sight of today in our culture of plenty. Sounds like you have tremendous success with parsley! Lucky you to have it reseed and get lots of volunteers. I agree that the real purpose of food is indeed one of the most important things we have lost sight of today. Ha, I grew up on limp gray veg. so I’ve been re-learning how to prepare them properly. It’s great to keep learning. Last year we discovered that sweet potatoes from the garden were easy to grow and taste wonderful. That’s part of the fun of gardening too – trying to use it all, not to waste any of it, give some away, and enjoy learning new things.